Boil corn for 5 minutes, drain in a colander, and allow to cool. While corn is cooling, sauté sliced shallots in a saucepan with 1 tablespoon of olive oil over medium heat for about 5 minutes. When finished cooking shallots, turn the heat off and add the butter to the pan so it can melt. Once the corn is cool enough to handle, carefully cut kernels from cob. Set aside ½ cup of kernels for garnish. In a food processor, combine remainder of the corn kernels, the chicken broth, salt, cayenne, almond milk and the shallots with melted butter. Blend until thoroughly combined into a smooth puree. Transfer puree to a medium bowl and set aside. Divide the scallops into groups of similar size, so you can cook batches of similar size together. Salt the scallops and place them on a paper-towel lined plate and blot the excess moisture. Heat up a large cast iron skillet or sauce pan over medium high heat then add the chorizo. Cook for 2-3 minutes then using a slotted spoon remove chorizo from the pan but leave the oil. Keep the pan hot and add the scallops. Cook for 2 minutes a side, and be sure to not over cook them. Scallops should be golden brown. If needed, cook them in batches (about 7 at a time) to avoid over-crowding the pan. Add a little olive oil between batches if needed. 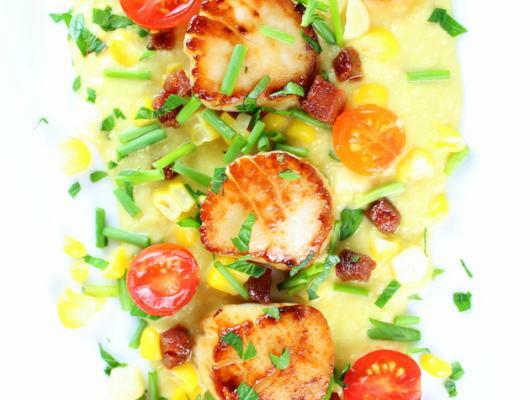 Serve the scallops on a bed of corn puree, garnished with remaining fresh corn kernels, chopped scallions, halved cherry tomatoes and cooked chorizo. Recipe Notes: Dry scallops are preferred to wet scallops! If you are uncertain ask your fish market which they are selling you. If you are only able to obtain wet scallops, rinse them of any milky residue & dry with paper towels. Frozen corn can be substituted for fresh corn. Thaw and heat up in a sauce pan for a few minutes. 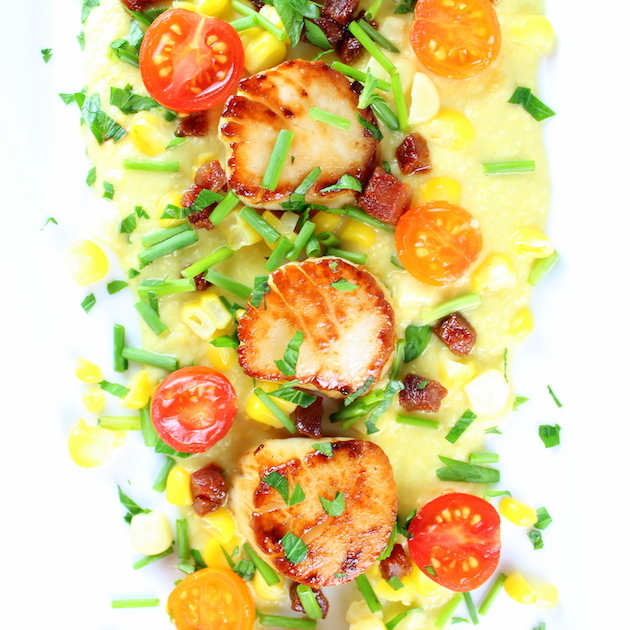 Pan-Seared Sea Scallops with Corn Puree - delicious, decadent, & low-calorie. Full of protein & flavor! With chorizo, cherry tomatoes, shallots & scallions.